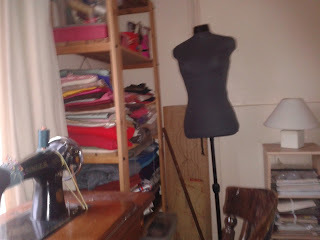 Have FINALLY finished off the unfinished "projects" in my sewing room. Below are the cushions I made to cover the odd shaped foam I had put away. It isn't really the right shape for either chair, but doesn't look too bad. The material is scrap and the zips are from a bunch of four I bought in a charity shop for 40p the lot, alongside a few cones of thread ( more later) behind the chairs are two scatter cushions for the warm room I inhabit much of the time. Below is a picture of a couple of "gizmos" made by D yesterday. ( I tend to have to wait for rain to get such jobs done) I needed something making that would enable me to use the aforementioned cones of thread on my beautiful treadle machine. He made this with a piece of pallet wood and a coat hanger and it works beautifully ! In front of the cone holder is another piece of pallet wood with four pieces of dowling inset, to organise and keep my shuttles tidy. What would smallholders do without pallets (and baling twine) ! The last piece I have a (not very good) picture of is a wall hanging. Most of it is machined with just a few pieces done by hand. I have backed it with some sheeting, which I have turned over at the bottom so that a piece of wood can be inserted as a weight. When I showed it to my youngest yesterday she was able to identify each scrap of material and seemed surprised that I had held onto them for so long. Discussing where each piece came from reminded me of the happy hours I used to spend with my mother when working on peg rugs and listening to her stories of where each piece came from. I haven't photographed the trouser alterations and new zip insertions as that would be TOO boring. So the good news is that all the odds and sods of sewing are now completed and I can attack my newly organised stash with a clear conscience oooooooo... what to do !? I am certainly going to start some quilting. I quite fancy doing a waistcoat and a set of cushions. I have also found a great pattern for a giraffe which I shall make for a young relative for a present. I reckon that is enough to be going on with. On matters non-sewing, I cleared out my baking cupboard today and found all sorts of scraps... dates, cherries, nuts, mincemeat, stem ginger etc so I have made a huge fruit cake.I also found a bag of muesli that I wasn't too keen on so have turned this into a flapjacky sort of thing. Oh yes! and I washed the cupboard out! I have also made 5kg of sugar fondant for the bees. I have set this in 5 containers and as soon as possible I will place it in the hives in case they need it. ( fingers crossed that they are still sleeping and haven't died ) Granddaughter tells me that she was speaking to a bee keeper last week who has lost 18 hives and his friend even more. What a tragedy ! It was D's birthday yesterday. The family came for tea and I "did an Indian". I made chicken (cockerel) korma, spicy lamb curry, red lentil Dhal, onion bhajis, yoghurt dip, onion,tomato, cucumber and mint and a large garlic foccacio-type bread. For dessert we had a pavlova with candles on top. Most of the ingredients were home grown, so it wasn't a very expensive "Do"
They tell us that there should be snow on Friday and then it will start to get warmer. Can't say that I won't be pleased that I won't be defrosting and ferrying water around for the hens and rabbits. The poor things are so fed up of the snow, at least I have warm boots to wear ! Here is a the front of our house, the front garden looks tidy in the snow ! My resolution not to start on my stash of materials until I have finished all started projects is compromised by my 20 year old grandson who wants to attend a party this weekend as Peter Pan ! So after a fitting with this (6' 3") tall young man, the other projects are pushed aside while I see what I can do. Said grandson and I went to the library today. The librarians really are helpful and knowledgeable and the libraries offer so many services other than lending books that it is distressing to know that libraries are at risk of council cuts. Had a major bread bake today. Also made a large pavlova for D's birthday tea on Sunday and a fish pie for today's tea. Having a break tonight from knitting and sewing and am reading the delicious seed catalogues. I still have a quite a few seeds left from last year, so need to go through those to see what I need. It will be next week before I get around to that little job though, as I have a back log of housework, Civic Society paperwork and birthday boy to look after. Oh yes.. and a Peter Pan costume to make !! It has been snowing all night and very cold here. We are hoping to go to a funeral a funeral today, but may not get out of the drive, if we do the roads aren't too bad. Thought I would put up a summer picture to cheer us all up. This is my middle veg patch, as you see I like to grow flowers in with the veg. I do sell the odd bunch of flowers, but they are more to look at than anything. Just had a large bowl of porridge with golden syrup and single cream!!! (left over from yesterday's pudding) that should warm my cockles ! I thought you might like to see my two favourite animals. Unfortunately Annie our goat died just before Christmas, but her presence is still felt here. As you can see she was a great character and even though she couldn't see me she knew I was there. It has been snowing here since 5 o'clock, with the main band of snow expected in the early morning. We are well prepared for any eventuality ( you can't take risks with animals and children) Some years ago after a heavy snowfall we were without electricity for 6 days and in the small town my daughter lived in they lost the water supply too. I am a into self sufficiency, which some may find extreme, but better I reckon than those who eat all the food they have until there is nothing left before they shop again. I understand this for fresh food, but keeping a good stock of dried and tinned food would be a good idea for all sorts of reasons. I have organised the lamb meat which is now in the freezer. So today I have been processing what is left for the animals and wild birds. The liver, lights etc have been in the slow cooker and I will cut that up and put into portions for Dixie and my granddaughter's dog and put into the freezer. The suet I have strung up for the birds and the rest of the fat I have rendered down and shall make "cakes" tomorrow with crumbs, sultanas, oats etc and anything else I can find that might take their fancy, to put on the bird table. Called in Lidl today, they have unwaxed lemons (and unsalted butter) and we now have plenty of eggs so tomorrow I shall make lemon curd. Great job when you are unlikely to be outside for long. Though the animals do take longer to see to in the snow and frost, I shall be back inside for 9 o'clock and the smell of lemons will permeate the house in no time at all! I shall now knit for half an hour and take myself to bed with one of my Christmas books. ..What will tomorrow bring ? Well, didn't sound too bad on the radio this morning. It looks like they are following a frugal no-waste theme this week in response to the shocking but unsurprising news that we throw away half the food bought. As they gave out my blog address I have had quite a lot of views today. I hope that more people will look to reducing their waste and I expect those visiting my blog will visit the others that I follow. They would be bound to find someone they could relate to I am sure. Let me introduce you to Prickly Pete ! PP is an hedgehog that D. found wandering weakly in the garden one cold night (Dec. 12th 2012) As D. had just cleared out the log box, which is made of bricks, next to the lounge fire, he popped PP in there with some cat food and bedding. Googling how to look after hedgehogs in winter he found that they must be 600g before they can safely hibernate. PP only weighed 400g. so D was determined to build him up ( we are quite good at that in this house!) So here we are in mid January and PP rules the roost in the lounge and is eating us out of house and home. My neighbours lost their beloved dog in early December and asked if we had a use for their stash of tins of dog food. Never ones to turn anything down we accepted. Now I'm not sure if Pedigree Chum is recommended for Hedgehogs, but if it isn't nobody told Prickly Pete.. now weighing 620g ! Snow today and am pleased to say that our garden looks as tidy as next doors' garden for once under the blanket of snow! Chickens hate the white stuff though and so I have fed them in the empty greenhouse and the barn. A little more work done on the unfinished projects today. I must get them finished soon as the beautiful tidy stash of materials is calling me. Batch of bread made and kitchen tidied ready for the Civic Society's monthly Committee Meeting here tonight. I now need to put the cheese pie in the oven for tea and then get the Agenda ready for the meet. Great News ! Foster Dog has gone to his "Forever" home. A Rescue worker drove some considerable distance to us from east Notts., picked up my daughter and Foster Dog and took them both an even greater distance to west of Birmingham so that Foster Dog could be settled and handed over with as much info as possible. She then drove my daughter back here before she drove to her base again. This has ensured the best possible start for his new life. We miss him after just a couple of weeks with us, so his new owners are bound to love him! Just had an email from the young reporter who interviewed us last week. She tells me that it is to go out on Monday morning sometime between 7 and 9 o'clock. It will be interesting to see how we come across...Mad?...Weird?...probably! Interesting that the programme is the same as I was interviewed on a couple of weeks ago as a representative of the Civic Society. Cheese, onion and potato pies x 2 . Lined deepish dish with pastry, filled with 4 potatoes diced and cooked and two onions chopped and cooked, mixed with half a pint of cheese sauce frozen at Christmas. Bacon, potato, leek and cheese x 1 Lined pie dish with pastry, filled with potatoes cooked and diced (cooked same time as for cheese pie) sliced leek ditto (same pan), fried cubed thick bacon from Lidl cooking bacon, blended all with a little of the aforementioned cheese sauce. covered with pastry top. Chicken pies x 2 - Lined pie dish with pastry filled with - chicken pieces left after roast chicken dinner, small sticks carrot (ditto) a few peas (ditto), cubes of cooked stuffing (ditto) thickened gravy from ..you guessed it ditto !. covered with pastry top. Regarding lidl cooking bacon - personally I always cook bacon! What they mean is bacon pieces. If you choose carefully you can bag a real bargain here. I look for the packs with a few chunky pieces. This week for £1. 59 I had enough for 2 really thick bacon steaks which we had with our eggs, a bacon sandwich ( crafty one when on my own) cubed bacon for the above mentioned pie and after cutting the thick rind into strips I put them in the oven on a tray and now have lovely crispy "scratchings" to nibble while watching TV tonight. I'm thinking "FISH" for another post. D. loves fishing and we regularly travel to Looe in Cornwall so that he can go sea fishing. As you know we never waste anything so everything he catches we put into our travelling freezer and bring home. This is the main reason for the number of freezers I own ( this and the lambs of course!) So prepping and cooking fish is something I do quite a lot. Anyway I reckon that's enough from me for now... back to my knitting. Yesterday's visit from the reporter from local radio left me wondering what rubbish I might have said! She wanted to walk around outside while we discussed how we lived our life and recycled old pallets etc. Fortunately D. was there too so she had two of us rabbiting on! Our cockerels also had much to say, which she seemed happy to record. After we had visited the gardens ( and those of you who grow vegetable know that the veg garden in january is no pretty sight!) Chickens, rabbits and sheep we came inside to have look around my sewing room and then sit at the kitchen table discussing recipes, knitting and why I had started my blog. She will email when her article is to be broadcast. Ham (frozen) from Christmas today with a sort of potato Gratin that I made with some single cream left over from Christmas that was still perfectly allright to use. ( If it had been double cream I would have whipped it and piped it onto greaseproof paper and frozen for cakes/pies, but single cream doesn't freeze) I added half a chopped onion, a clove of garlic and an egg to the mix poured it over chipped potatoes and cooked for for 45mins at 180C. We had this with half a tin of baked beans and some homegrown peas and carrots from the freezer. D. said the potatoes could have had a bit more cooking ( he was right) so I would add another 10 to 15 mins to that time. Have finished a couple more sewing "projects"today. I have covered another chair cushion and made a new carrier bag holder for the kitchen as my other one had finally collapsed ( now a floorcloth) I use the old carrier bags as rubbish bags and when they are full tie them up and put them in the dustbin. I personally don't get carrier bags as I always use cloth shopping bags, but my daughters and friends are always giving me those they have acquired. The old curtains now hanging at the kitchen doors have made a HUGE difference to the temperature of the kitchen, I am extremely pleased with the result, which will keep the heating bills down. Hoping to start planting tomorrow. I will start off the early tomatoes and onions under heat and the first sowing of broad beans in the cold frame. Sat in my kitchen with a reporter from the local radio station ! " We've been reading your blog, can I come and talk to you? we think people would be interested"
It has been a pleasure to have this young woman here. She has recently started knitting (using a u-tube tutorial - what a good idea!) and is clearly interested in living carefully. Have to go out now, but will get back to this blog later. Have finally worked out how to show my blog list. Yes, I know I'm a bit slow! So you can now see who I follow so far. I made some (short as possible) shortcrust pastry with a little sugar added. lined a square tin with half the pastry, brushed this with a little honey ( you could use jam if you haven't any honey) I covered this pastry with sliced Christmas Pud and covered with the remainder of pastry, also brushed with honey/jam. I sprinkled this with a little sugar and baked at 180C for 25mins. As I made a good lot of pastry I also made a large apple pie from the last of the Bramleys which I have been saving in the outdoor ( beer!) fridge. Put this pie in the freezer. 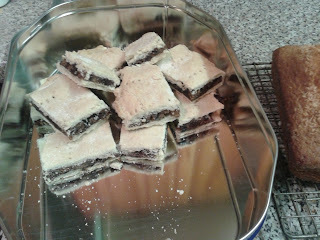 Here is a picture of the Christmas pud slice, cooling next to these are a couple of coconut cakes. I see that my garlic , which I always sow on bonfire night, is poking through. I have used my own saved "seed" of "Marco" and it looks as though all 45 plants are viable. Great ! I still have plenty of last years garlic hanging up, which should last me until mid summer at least. Still picking brussels through they are not as good this winter, but I don't mind if they are "Knobby" or blown. A lot of people in this district call brussels "Knobbies" ! The "Tuesday gang" have been working on the line of the canal again today. They have to do all the tree and shrub clearing before the birds start nesting, so spend as much time as they can spare doing this type of clearing before the middle of February. From the sewing room project pile I have now done the trouser alteration and zip replacement and made a covered cushion for a kitchen chair. I have also altered and hung two large curtains at the kitchen doors which lose a lot of heat. These outside doors are the only ones in the house that aren't double glazed and the top half consists of 12 small glass frames. The doors don't fit too well either as the house has funny shaped door frames and D bought the doors from the tip about 14 years ago for £5! Four unfinished projects to go. I will try to post pictures if the finished articles aren't too dire! The egg situation improves enough for me to put my Free range Egg sign out as well as meet my orders. This means that the hens start to pay for themselves again. Hurrah! It looks as though Foster dog may have a "forever" home from this weekend. I do hope so, he is turning out to be a delight and is even behaving himself more with animals.... though still not to be trusted with them obviously. We have all our fingers and toes crossed for him. Had quite a few new visitors to my blog today. Probably because I have "Come Out" on Facebook! It occurred to me that the first thing that new visitors would see are pictures of my sewing room! Brilliant ! How interesting.... a room! I hope people read a little further to make sense of the it. Though I probably wouldn't ! Have been carrying logs for some time this afternoon, from some canal clearing in the village. As a consequence my back is complaining and I need to be horizontal! Foster dog exercised, cat fed, so time for bed. I wish everyone a peaceful night. 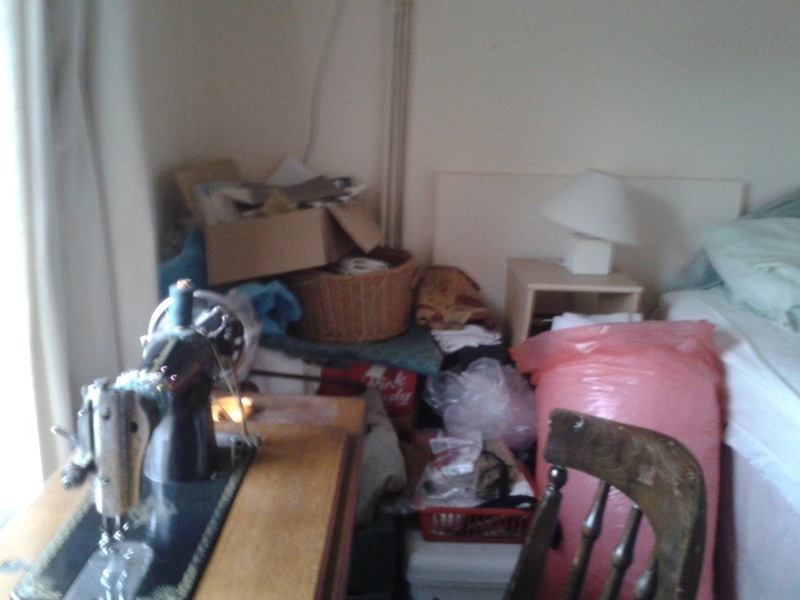 Here are the before and after shots of my de-cluttered sewing room !! Yes I know it was disgusting before ! Foster dog continues to live in our large spare room ( en-suite no less!) and to exercise whenever our cat is locked in a downstairs room. This dog really doesn't like cats, and I reckon our cat is not too keen on this dog either!, she's usually good with dogs, but not this one... Cats are canny things. We thought that he had been rehomed today, but unfortunately the guy who was giving him a "forever" home had some bad news and couldn't guarantee it would be forever. So better if the poor dog is not just moved on from pillar to post. However the situation here is far from ideal and is not fair on either animal. let's hope tomorrow brings some good news. On clearing out the sewing room( I still haven't worked out how to load a photograph from my mobile to show how well I have done) I find I have 6 unfinished projects. The lovely neat piles of material and wools tempts me to start something new (especially Frugal Queens latest project...genius patchwork!) But I resolve to finish the projects first. Like just about everyone else in Frugal world I have resolved to keep away from the shops ( not TOO difficult for me as I hate shopping) and feed us from whatever I have in the fridge , pantry and freezer. This is also is not in the least bit difficult as I am closet Prepper and have three freezers, all just about full! it tends to be butter and milk that I run out of as I no longer have milking goats. Today I threw some cooked potatoes in the oven with some spare garlic butter I had made, with some chopped onion I then added a jar of feta cheese in oil ( good old Aldi) ten minutes before serving and we had this concoction with the last of the mushrooms from Lidl and some of my green beans in tomato sauce that I froze in the autumn. Oh yes and some home made bread. No pudding.. too full. Iv'e just realised that all that food put aside makes us sound really greedy. Tho' D and I live here alone with our animals we are rarely on our own, being blessed with family and friends and our Shared Lives Guys so we do get through an awful lot of food. As we have had no rain for four/five days now (Shhhhhh!) we can start to work on some of the vegetable patches tomorrow in readiness for the big spring plant. Excellent so long as nothing happens to scupper the plan ! Talk about the best laid plans !! I was going to clean my propagators and our smaller greenhouse today in readiness for the early onion and tomato seed. However, I have spent much of the day on the phone to the local radio station who wanted comments about a nearby bridge being hit by lorries. As the secretary of the local Civic Society who opposed the demolition of another old bridge for several reasons, not the least of which is that it would make other bridges vulnerable from strikes, the local rag wanted me to say " We told you so!" They now want me to be interviewed at the site of the bridge and " Can you make 7.20 tomorrow morning?" Then there is a foster dog !! My daughter had agreed to foster a dog for a few weeks while it was found a new home. Having lost her old girl earlier this year (and coming from a family that fosters humans !) she said she would take care of the dog for a while, so long as it was good with cats (she has four) and 9month old puppy (her grown up daughters') "No problem" they said. This lovely dog HATES cats and attacks puppies ! and it really is a lovely dog, good with humans and fine so long as not on a lead. So for now it is having to live with us until it can be rehomed. Fortunately we have a big enough house for Rocky to have his own quarters. We too have a cat and several dozen hens, 6 rabbits and 2 sheep so the poor blighter cannot run free as would be kindest. The rescue charity are finding the "forever" home asap. Must watch David Attenborough's "Africa" tonight.